Car rosaries remind people to pray for safe travel and keeps them protected on long and short journeys. A five-decade rosary with a pendant works well for a car rosary. You can make a car rosary as simple or ornate as you wish. 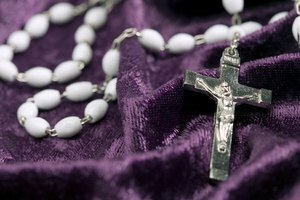 here are three traditional ways to make rosaries, any of which can be adapted to hanging in a car. 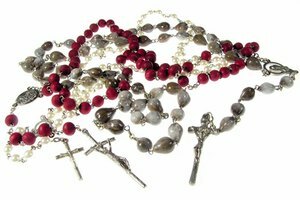 Knotted cord, strung and chain rosaries are the traditional types. The following instructions are for a strung rosary. 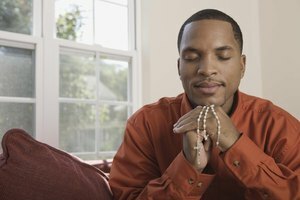 Whether you keep your rosary for your own car or give it away to a friend, be sure it will be used. String the wire through the crucifix loop. Use a length of wire long enough to hold all the beads with wire left over. Tie the wire into a knot right above the crucifix. One inch higher, tie the wire (there will be two now) into a knot. Run a Pater bead onto the top of the knot. Follow with a connector bead, three Ave beads, another connector bead, and a Pater bead. 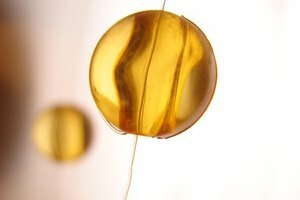 Add two connector beads above the Pater bead. Allow the wire to separate into two wires. Add one connector bead to each wire. String ten Ave beads onto each wire. Alternate each Ave bead with a connector bead. Add two connector beads to the top of the tenth Ave bead. String a Pater bead to each wire and two connector beads atop each Pater bead. Repeat the Ave/connector beads alternating process in the previous step. String two connector beads above the Ave beads on each string, adding a Pater bead onto the connector beads. Add two more connectors to each Pater bead. Beginning with a Ave bead, alternate ten Ave beads with connector beads. Twist the wire 3-4 times. 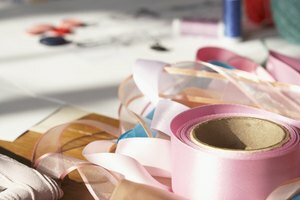 Wrap both sides of wire around the twist. Make sure that the tie is as small as possible. Hang over a rear view mirror. 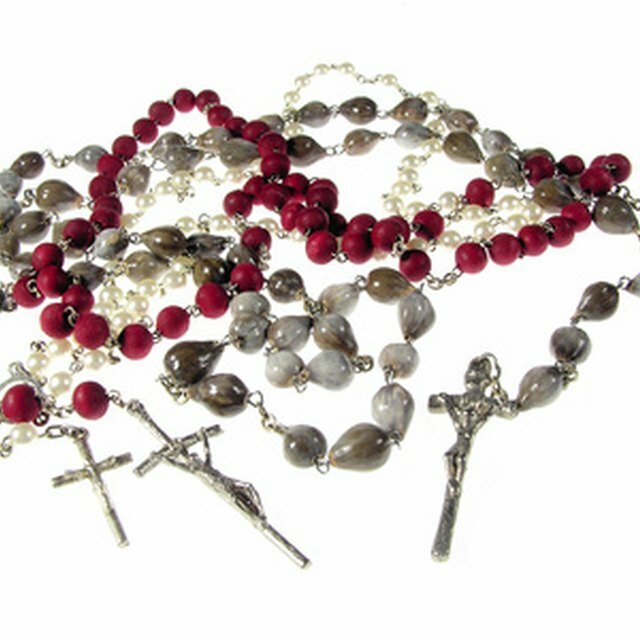 You can make your car rosary maller by using only two decades af Ave beads. The layout is the same. Paige, Alyson. "How to Make a Car Rosary." Synonym, https://classroom.synonym.com/how-to-make-a-car-rosary-12078680.html. 29 September 2017.